This weekend over five hundred gardens participating in the National Gardens Scheme opened their gates to raise money for nursing and caring charities, including Macmillan Cancer Support, Marie Curie Cancer Care and Carers Trust. 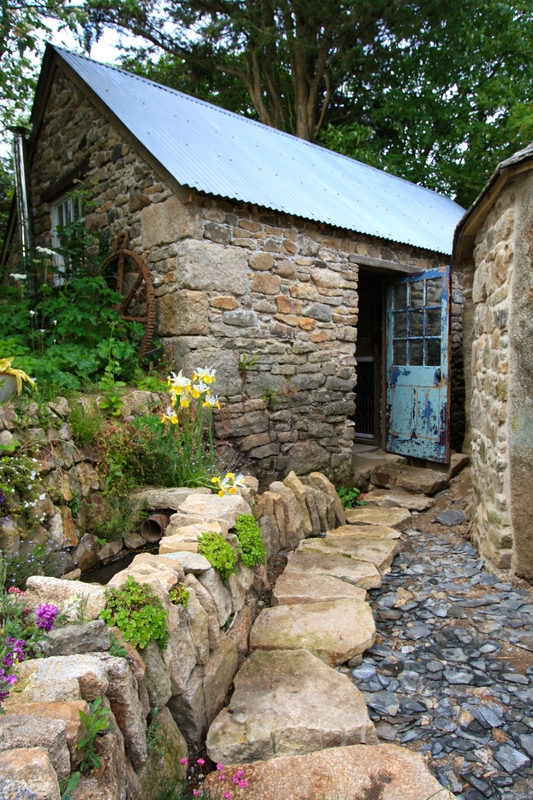 One of those was Trevoole Farm, Cornwall, fast becoming my adopted home in the South West. I was there to help out and to see my sister and new baby niece Martha, who is the sweetest girl in all the world. Here she is with her very proud uncle. Trevoole is much more than just a garden. 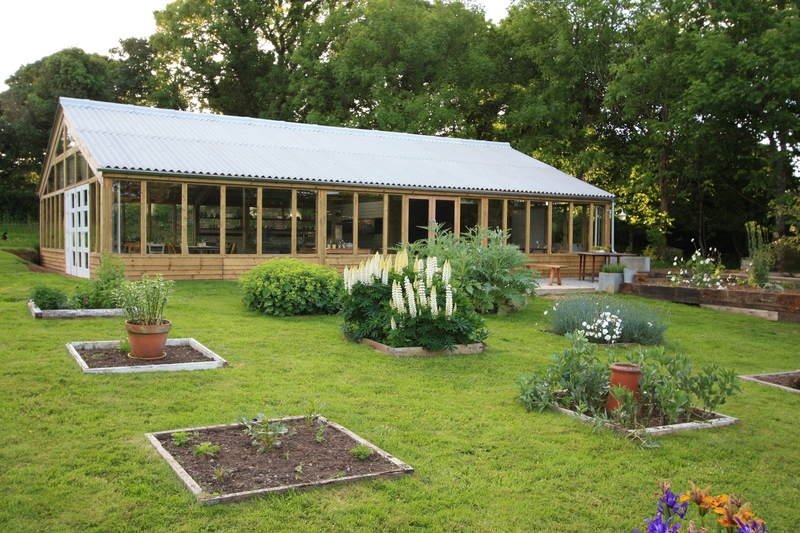 The popular summerhouse café and vintage shop has recently been joined by ‘The Glasshouse’ (above), a brand new catering venue, and an atmospheric Persephone bookshop, about which more very soon. The farm already has a loyal following among local people, attracting creative types and those in search of peace and quiet. The festival weekend attracted new visitors of all ages, some of whom are unable to experience Trevoole during normal Thursday and Friday openings. 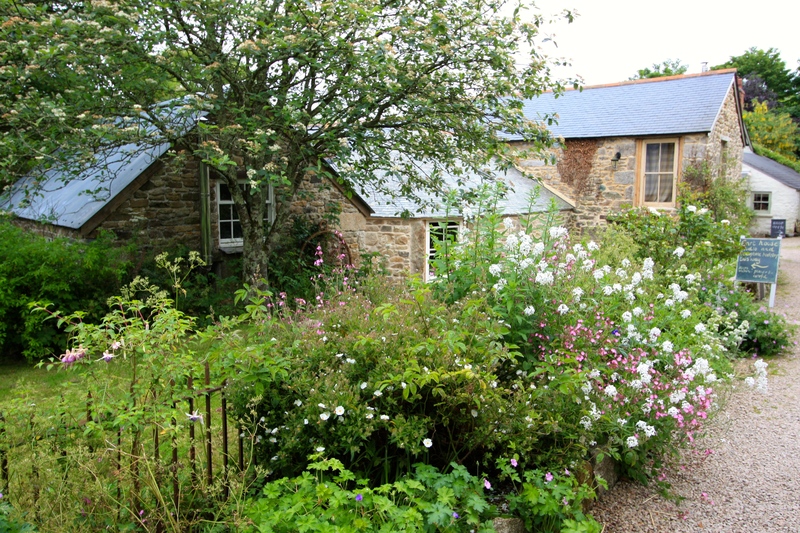 The garden itself was in fine fettle, a riot of roses, irises, hesperis, ferns and foxgloves. The primrose border, which I planted back in early April, is already prospering and I was able to fill in a few gaps. From the local car boot sale I purchased some fine Astelia chathamica, Digitalis parviflora ‘Milk Chocolate’, Digitalis ‘Dalmatian Cream’ and Campanula punctata ‘Wedding Bells’ which were less than half the garden centre price. In time, a handsome climbing Hydrangea seemanii will cloth the honey-coloured walls with glossy evergreen foliage. The idea is to restrict to palette of plants to greens, coppers, yellows and whites to create a restful space outside the carthouse. Many plants, such as the sweet box, daphne, violets and feverfew, are nicely scented. The carthouse itself (below) now has a dual function as a space for textile art workshops and as a bookshop. The roof will eventually be tiled, but for now is covered with corrugated iron which drums wonderfully when it rains. 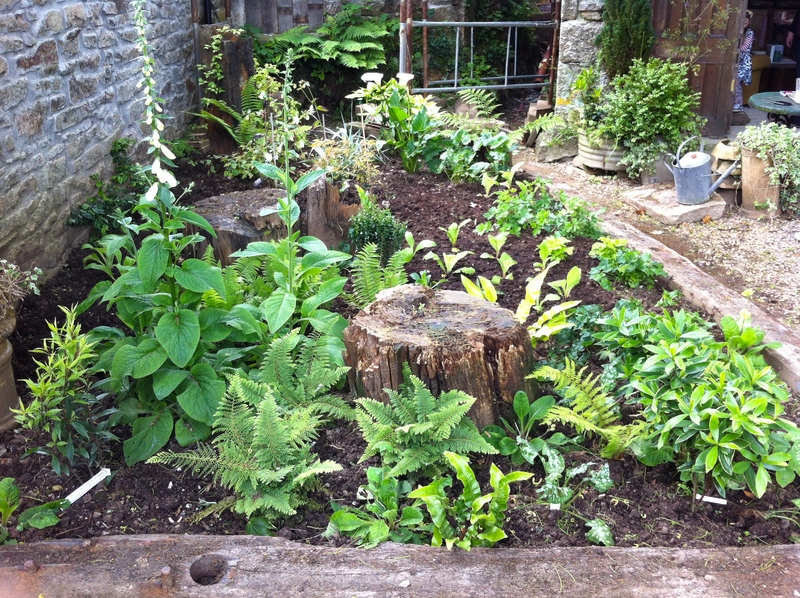 A feature has been made of the ephemeral stream which drains the garden after heavy rain. It flows between the carthouse and the library and progresses along the edge of the primrose border, providing it with the right conditions for Zantedeschia aethiopica and Primula bulleyana. 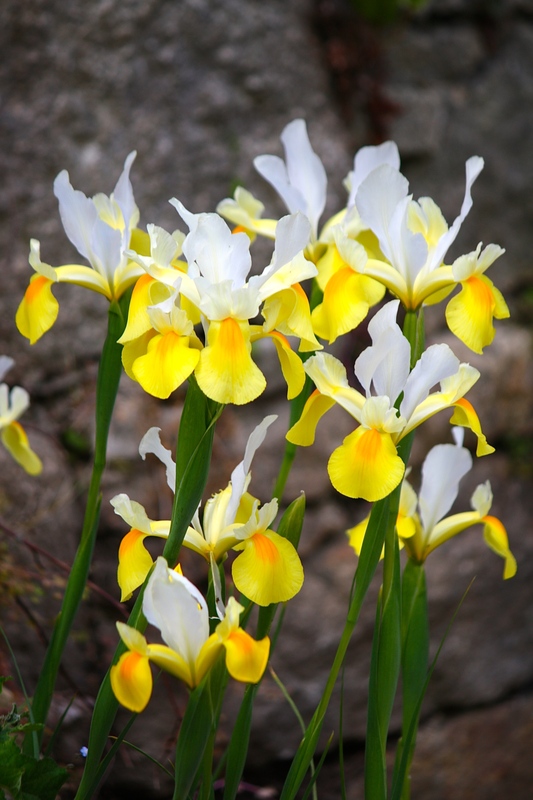 The striking yellow and white Dutch irises (Iris hollandica ‘Apollo’, above), were begging to be photographed, so naturally I had to oblige. Yellows are sometimes tricky to capture, but these came out pretty well. Trevoole is littered with such cameos and this is one of the reasons why I feel so privileged to stay there and enjoy the garden out of hours. 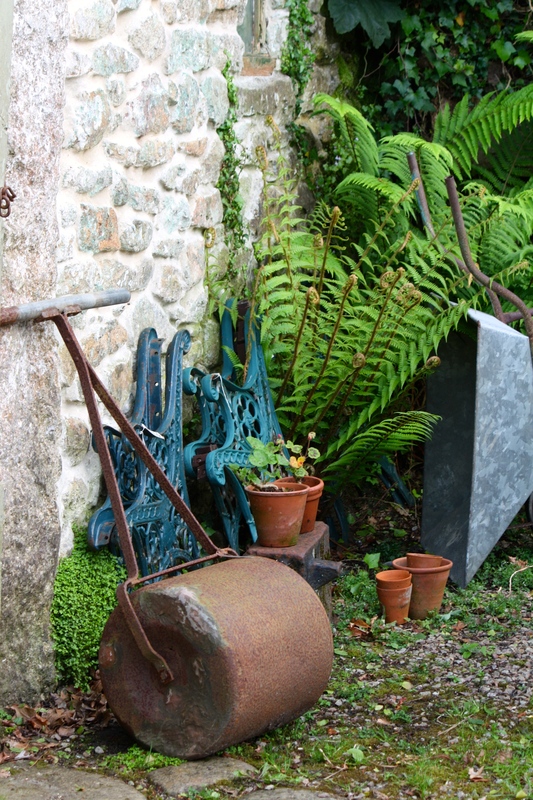 During the early mornings and evenings the light is sharp and beautiful, permitting studies like this one, of vintage garden equipment nestled amongst ferns. 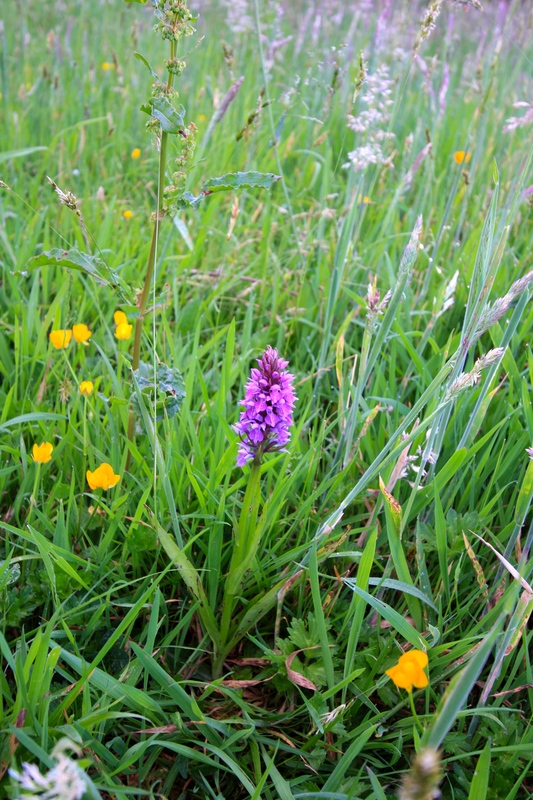 The highlight of this visit was the discovery of not one, but two varieties of orchid in the meadow. The first, with pale pink speckled flowers, was without doubt the heath spotted orchid, Dactylorhiza maculata. The other, pictured below, has proved trickier to identify. It has narrow, unspotted leaves and magenta flowers the colour of loosestrife. I think this identifies it as the northern marsh orchid, Dactylorhiza purpurella, or a hybrid between a northern marsh orchid and a heath spotted orchid. Should anyone know better, I’d be delighted to know. The garden festival weekend was a great success. Visitors showed genuine delight in experiencing this special place and were wonderful to talk to, many sharing memories of places like Trevoole which they knew as children. It’s great to think that across the country so many people were able to experience usually private gardens whilst supporting deserving charities. Trevoole is open every Thursday and Friday from now until Christmas. Keep an eye out on Trevoole’s Facebook page for details of gardening and craft events, and for ‘happenings’ in The Glasshouse. I for one will be returning as soon as I can. Finally, a plug for my my own garden, The Watch House, Broadstairs, Kent, which is open for the National Gardens Scheme on August 2nd and 3rd, 12 until 4pm. 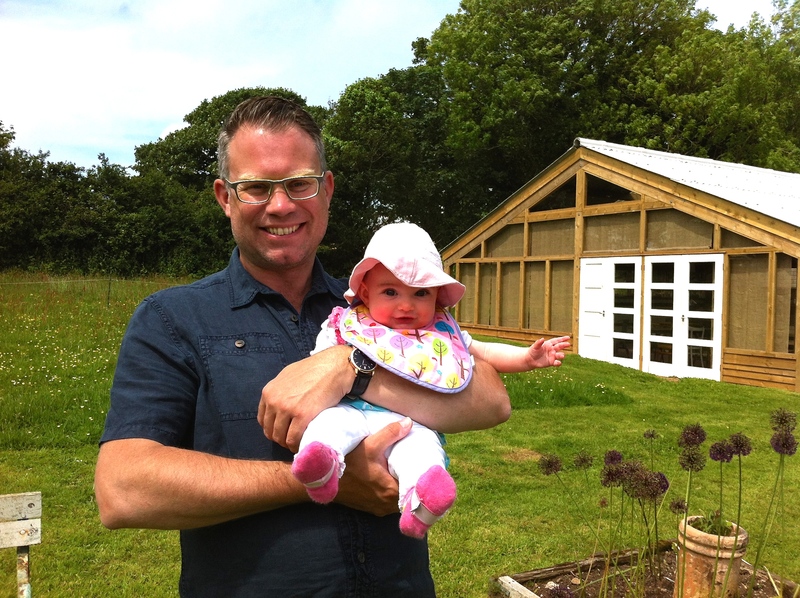 So very beautiful – love the entrance to the carthouse, along with the very handsome chap and baby!